An artist rendering shows the new FlightServ FBO which will be built at New Jersey's Trenton Mercer Airport. The facility, which will feature an 80,000-sq-ft hangar, is expected to be completed by the end of 2019. 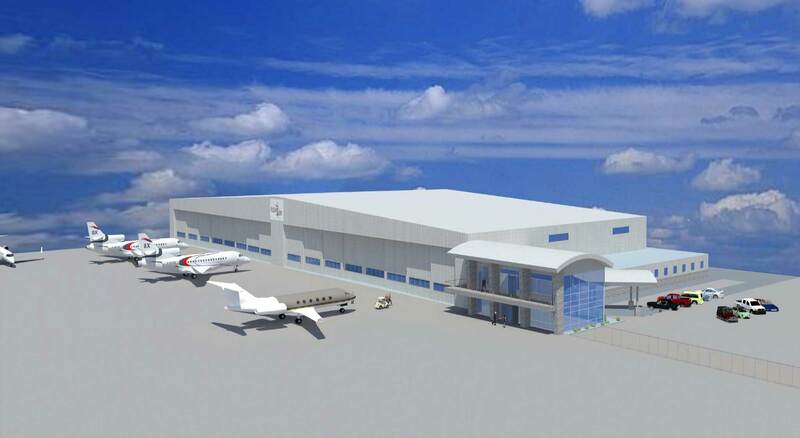 FlightServ, which began providing FBO services at New Jersey’s Trenton Mercer Airport at the beginning of last year, has received permission from the county and the airport authority to build a new FBO and hangar facility. The company has secured a new ground lease on a 22-acre site at the end of Runway 34, which was formerly occupied by the U.S. military’s Naval Warfare Center. The company—a sister to private lift provider Aviation Charters, which has operated at the airport since 1985—plans to demolish the existing structure and break ground next month on a modern FBO with corporate tenant offices and 80,000 sq ft of hangar space, large enough to accommodate the latest ultra-long-range business jets. The Avfuel-branded location, one of two service providers on the field, will also offer general aviation tie-downs, a de-icing facility, and a 44,000-gallon tank farm for jet-A and avgas when the facility opens by the end of next year.